Chicago Heights, IL-(ENEWSPF)- “It’s Delightful…It’s Delicious…It’s De-Lovely!” is what everyone will be singing after seeing Marian Catholic High School’s production of Cole Porter’s classic 1930’s musical, “Anything Goes”. 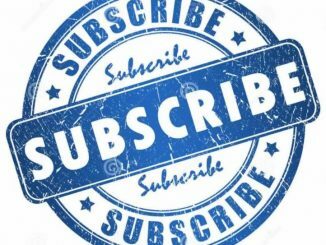 Performances will run April 12-14, 2019 in the Monsignor Croarkin Auditorium at Marian Catholic. Music, dance, laughs, and the age-old tale of Boy Meets Girl—no musical puts it on stage better than “Anything Goes”! A hilarious shipboard romp, wrapped around one of Cole Porter’s most magical scores. The story blossoms with love, friendship, mischief, and more! It has remained an audience favorite, playing to Off Broadway audiences in 1962, then returning to Broadway in 1987 and 2011. The musical introduced several songs that have become legendary standards, such as “Anything Goes,” “It’s De-Lovely,” “Friendship,” “You’re the Top,” “Blow, Gabriel, Blow,” and “I Get a Kick Out of You.” The charismatic cast of 40 includes leads Angel Alzeidan ’19 (Schereville) as Reno Sweeney, Kyle Lavin ’20 (Chicago) as Billy Crocker, Shannon Fitzgerald ’20 (Park Forest) as Hope Harcourt, Andres Vazquez ’21 (Chicago) as Moonface Martin, Ashley Saul ’20 (Park Forest) as Bonnie, and Blake Recupido ’19 (Matteson) as Elisha J. Whitney. 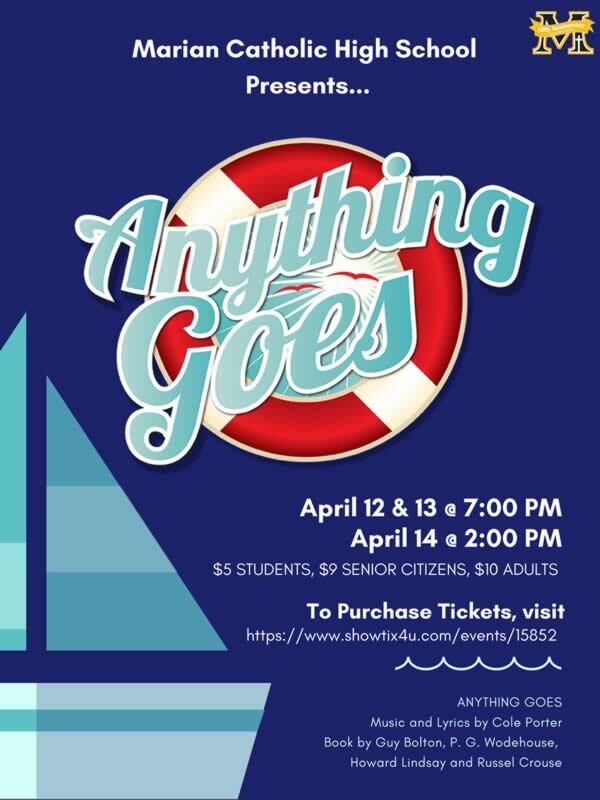 Marian Catholic’s staging of “Anything Goes” is directed by Laura Hilger ’14, with the assistance of Claire Jakubisin, Choral Director, Greg Bimm, Director of Bands, Brandi Brumfield, Choreographer, and Sam Sullivan, Technical Director. Performances of this classic hit will be at 7:00 p.m. on Friday, April 12 and Saturday April 13 and 2:00 p.m. on Sunday, April 14. Tickets are $5 for students, $9 for senior citizens, and $10 for adults. Tickets may be purchased at the box office upon availability.